The full lineup at the "Star Trek: Discovery" panel on Oct. 5, 2018, at New York Comic Con. NEW YORK — The "Star Trek: Discovery" panel was undoubtedly "Best in Show" at this year's New York Comic Con (NYCC). Moderator Rebecca Romijn, who will play the part of Number One in Season 2, asked some great questions to the assembled cast. Romijn apologized in advance to the packed theater in case she got some technical terminology wrong. The trailer shows the crew dealing with a mystery involving seven mysterious signals of unknown origin. Additionally, the preview shows Spock experiencing visions of something called the Red Angel, which Michael Burnham confirms she's seen, too. "The seven signals, who sent them and what do they mean is the drive of Season 2," Kurtzman said. "The Discovery crew is trying to figure out what they [the signals] mean ... are they a message? We don't know. There's a lot of interesting conversation about science versus faith. What does faith mean? Even Starfleet can't really understand what they are, where they came from." Kadin said she was more nervous about the first season than she is for this one. "We had so much to earn from the fans who have loved this [franchise] for so many years. "I hope that we've earned the right to push more buttons and go in more directions, because fans feel confident that we know we're going to come back to a place they feel really happy with," she added. "There's been so much joy in the writers' room and in the production this season." "Now, we get to tell stories that explore — and, keep in mind, we were in a time of war last year, so there was a different kind of urgency and pace to everything — but we get to explore a lot of the philosophical issues that 'Trek,' at its best, has done," Kurtzman said. "I will say that this season is bigger visually than Season 1 … and Season 1 was pretty big," Kadin said, laughing. "But we kicked it up a whole several notches in terms of what we're delivering in action sequences. So, [we're] holding the balance between the great character work that 'Trek' is known for, the humor that 'Trek' can be known for [and] the thoughtfulness that it's known for. And then, the scope and scale of a big, big movie. All of those things play out in Season 2." Doug Jones, who plays Saru on "Star Trek: Discovery," appears at New York Comic Con 2018. For a moment at the end of Season 1, Saru served as acting captain of the U.S.S. Discovery — though a permanent promotion to this position still seems to elude the poor Kelpien. "In Season 2, he finds out something about himself and what it means to be a Kelpien that he did not know and that you don't know," Jones said. "This will be altering, challenging for him. He's on a path of evolution, as we all are in the show." The third installment of the series of stand-alone short episodes "Star Trek: Short Treks," called "The Brightest Star," debuts Dec. 6 and will follow Saru at a time before he joined Starfleet, when he lived on his home planet, Kaminar. "In the short, we go back and discover how he grew up and his curiosity and how it got him off the planet," Jones said. "He's the only one of his kind who's ever been off that planet. He's the one who joined Starfleet and the first to go and become an officer. "You get to meet my sister, the lovely Sarana, played by the beautiful Hannah Spear. You'll see more family and what my home planet of Kaminar looks like." Jones said. Mary Wiseman, who plays Tilly on "Star Trek: Discovery," appears at New York Comic Con 2018. "At the end of Season 1, you know, she was admitted into the Command Training Program. So, she's going to continue that journey, figure out what it means for someone like her to be an officer," Wiseman said. "I'm excited. Tilly gets angry this season, like she gets pissed," Wiseman added, laughing. When asked if getting angry meant tapping in to the Capt. Killy alter ego we saw in Season 1's Episode 10, "Despite Yourself," Wiseman seemed to relish the idea. "Oh, that's such a good question," she said. "I don't know. If we all have a seed of humanity and it's [a] matter of where we're nurtured, [that means] she contains the capacity for whatever Killy is, which is cruelty and rage and coldness. So, yeah, there has to be part of that in there, because maybe biologically they're kind of the same? Yeah, that's a good question, and I will use that. I'll steal that from you in the future." Ethan Peck, who plays Spock on "Star Trek: Discovery," appears at New York Comic Con 2018. 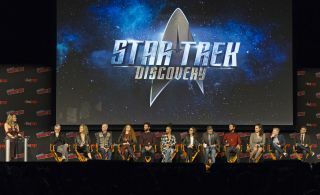 In August, the "Discovery" creative team announced that Ethan Peck, the grandson of legendary actor Gregory Peck, would appear in the role of Spock for the show's second season. Portraying Spock is no easy task. The character is half human, half Vulcan; his mother is Amanda Grayson, a human schoolteacher from Earth, and his father, Sarek, is a well-known Vulcan scientist and diplomat. Throughout his life, Spock's combustible combination of ancestry has caused problems. The events taking place in the show now, with Peck playing the role, occur 10 years before Spock's life in "Star Trek: The Original Series," so he's not yet fully matured. "I think that you have to have somewhere to go with him, right?" Peck said. "[Original Spock actor Leonard] Nimoy is inimitable, and [Zachary] Quinto played an alternate-universe Spock [in the rebooted 'Star Trek' movies]. And so, he's written on the page very differently [for our show]. And slowly but surely, he will become, I think, who we've come to love and adore in 'The Original Series.'" Peck added, "I like to reference this quote from [the 'Star Trek' film] 'Wrath of Khan,' when [Capt. James T.] Kirk speaks at Spock's funeral, and he says that of all the souls he has encountered, Spock's was the most human. And I think on the page that I got, he's a humanist. And he struggles to make sense of his love and his care for all beings. He's such a peaceable person. And that's very important to me in my construction of him." Sonequa Martin-Green, who plays Burnham on "Star Trek: Discovery," appears at New York Comic Con 2018. What to say about Burnham?! Throughout Season 1, she had a roller-coaster ride, from being blamed for starting the war with the Klingon Empire to losing her close friend and mentor Capt. Georgiou (Michelle Yeoh) to learning that her new captain, Gabriel Lorca (Jason Isaacs), is actually from an alternative, mirror universe where Georgiou lives … as emperor of the Terran Empire. Set phasers to stun. As for Burnham's arc this season, having reclaimed her Starfleet rank as commander, the once-disgraced officer will now focus on mending her own psyche. "Well, I will say [that] Season 2 is deeply emotional," Martin-Green said. "Season 1 was very emotional as well, but we go to another level in Season 2. This war is over now, and now there is time to deal with the aftermath. Now, there's time to deal with the residual effects of this war and the choices that we had to make and the things we suffered and the things that we lost. We have to deal with them now." One of the biggest questions from fans is why Spock has never told anyone about Burnham, his adopted sister. "Oh, gosh, yeah, and we mention that, too," Martin-Green said. "You know, there's a long game with 'Star Trek: Discovery,' because it is hyper-serialized. And because it is a novel told in chapters, there is a through line, and there are conceptual weavings that take time to unravel. … But I really encourage everyone to trust that [with] every single question that we raise in 'Star Trek: Discovery' that may seem like it's not canon-compliant, every one of those questions gets answered. Every one." Michelle Yeoh, who plays Georgiou on "Star Trek: Discovery," appears at New York Comic Con 2018. Ah, Emperor Georgiou, without a doubt a character Yeoh relishes playing — perfectly illustrated when the actress leapt from her chair during the NYCC panel and demanded the audience bow to her We last saw Georgiou running a club in the Orion market on Qo'noS and being recruited by Agent Leland (Alan Van Sprang) from Section 31, Starfleet's clandestine branch. "When Leland came to her with this black badge, she was very intrigued," Yeoh said. "And for Georgiou now, it's a really interesting role, because not everybody knows that I was from the mirror universe. So, sometimes I get to play the good captain, which is always very nice. Compassionate, kind and then, with Philippa Georgiou from Section 31, she is, cunning, devious, and we're all in leather, the whole time. It's hot! I mean, it's hot!" Anson Mount, who plays Pike on "Star Trek: Discovery," appears at New York Comic Con 2018. The third actor at NYCC who is new for Season 2 is Mount, who joins the cast as Capt. Pike. We see him taking command of the Discovery in the season-opening episode. Mount contrasted Pike's style with that of Capt. Lorca from the first season, saying, "Well, that's what I liked most about the character, actually. The writers did a really good job of creating a completely new kind of captain with Capt. Pike and really fleshing out what we already know. Part of that is Pike knows [that] a really good leader has frailties, and publicly so. And he knows that his greatest asset is his crew. "What I really like about playing this character is that he is not afraid to admit that he is stumped, and he regularly throws the question out to the people around him, which makes for great bridge scenes," Mount added. The actor also said that his performance wasn't influenced by the original Capt. Pike actor, Jeffrey Hunter, who played the role in the pilot episode of "Star Trek: The Original Series," called "The Cage." That episode was later recycled as the two-part episode "The Menagerie" (Season 1, Episodes 11 and 12). "I felt like I need to make this my own from the outset, knowing what I know and doing my research. I wasn't really mining Jeffrey Hunter's performance for clues, maybe because there is so much about him that we don't know, about the character." Shazad Latif, who plays Voq on "Star Trek: Discovery," appears at New York Comic Con 2018. Probably the single biggest buzz surround "Star Trek: Discovery" last season was whether Tyler was in fact a Klingon spy and, more specifically, whether he was a surgically altered Klingon named Voq. As you may remember, Voq, the albino Klingon, was ostracized by Kol, and then we didn't see anything of him for quite some time. In the meantime, Tyler, was able to gain the Captain's confidence and win the heart of Michael Burnham. When we last saw Voq, he was speaking to L'Rell (Mary Wiseman) — a Klingon belonging to a house of spymasters — who told Voq he could defeat Starfleet if he "sacrificed everything." Of course, as Season 1 reached its climatic conclusion, all was revealed. "I will say that the difference [is] when we were here last year ... just three episodes had aired. Our big episode — four — aired the very next day. Of course, we couldn't even talk about the fact that it was his [Tyler's] first big episode," Latif said. "We left off [Season 1], and he runs away with L'Rell, and they go and try and act as ambassadors, almost, between the Klingons and the Federation and Starfleet. So, he is [in] this sort of limbo. Him and L'Rell are sorting some things out emotionally," Latif added. Mary Chieffo (center), who plays L'Rell on "Star Trek: Discovery," appears at New York Comic Con 2018. We last saw L'Rell helping to unite the Klingon Empire and leaving with Tyler. Where do we find her in Season 2? "She is now officially the chancellor of the empire, and there are a lot of struggles that come with that.” As you might have also noted in the trailer, there's also a bit of a new aesthetic going on – L’Rell has hair! "That's a really exciting addition that has been made,” Chieffo added. "In the 'Star Trek: The Next Generation' episode "Rightful Heir" (Season 6, Episode 23) Kahless is brought back as a clone, unbeknownst to Worf, at the beginning of the episode. Kahless proves himself by telling how he cut off a lock of his hair and dipped it into a volcano and water and made the first bat'leth weapon. With this blade, he killed Mogor, the terrible tyrant who was running Kronos at the time. "So, in the spirit of 'Discovery,' we took that one little beautiful scene that was planted from an earlier iteration and kind of expanded upon that. We see that in a time of war, the Klingons would shave their heads, and in a time of peace, we start to grow back out. "I really love the symbolism of that. I think there's also a theme for L'Rell in the second season of embracing her femininity as she embraces her power, which I think the two can coexist. It's not an easy road for her. There are men, specifically male Klingons, who take issue with a woman being in power." With Burnham's affections for Tyler, and Tyler's affections for both Burnham and L'Rell, this could be "Star Trek's" first love triangle. "Or love rhombus. That's what we've been pushing, love rhombus," Chieffo said, laughing. Anthony Rapp (center), who plays Stamets on "Star Trek: Discovery," appears at New York Comic Con 2018. Stamets was pivotal to controlling the displacement-activated spore hub drive, commonly shortened to DASH or spore drive. He mentions that Starfleet was working on some kind of nonhuman interface, because Lorca almost killed Stamets with all those jumps to get to the mirror universe. We saw him having some pretty trippy experiences within the mycelial network, and of course, over the course of that journey, he lost his partner, Dr. Hugh Culber (Wilson Cruz). Rapp didn't give anything away in either the panel or the press conference, which itself is interesting. It also makes you wonder how hard it must be for many of the actors — think back to Latif last year — to stay quiet at these events when others are allowed to speak more freely about events concerning their characters. "I find it really satisfying, as a long-term fan of these things, to see how much care is being taken to make sure that all of this does fit together," Rapp said. "But it is asking something of the fandom to have faith — and as we all know, many fandoms have been betrayed often by things, so I understand sometimes why they're skeptical. But they can have faith." Wilson Cruz, who plays Culber on "Star Trek: Discovery," appears at New York Comic Con 2018. And if you thought Rapp had been secretive, holy hive mind, Cruz couldn't say a thing. As you may remember, Tyler experienced nightmares of having undergone surgery following Klingon imprisonment and asked Dr. Culber to perform an examination on him. Culber discovered that Tyler's skeletal structure and organs had been surgically altered and that the Tyler personality had been overlaid on top of someone else's. This led the doctor to try to ground Tyler, triggering a reaction in which Tyler broke the good doctor's neck in the episode "Despite Yourself" (Season 1, Episode 10). "Well, I didn't know what was going to happen," Cruz said. "I don't always want to know all the things that are going to happen. Because I'm in this show, the character doesn't know, so it's nice to kind of discover as it goes along. What the producers had told me was that something rough happens, so I didn't know if that meant we broke up, we got sent to different ship, we died, whatever." Cruze sat last in the panel lineup, and when it was finally his turn to answer a question, he immediately laughed. "You know they laugh at me for [being] last, because ... all I can say is one thing about this whole thing. … We find him where we left him. I mean, honestly, I cannot tell you anything more than that. We find him where we left him." The cast and crew of "Star Trek: Discovery" gather for a photo at New York Comic Con 2018. Follow us on Twitter @Spacedotcom and no Facebook. Original article on Space.com.